Home arrow_forwardEmail Digest blogarrow_forwardDogs and Stress Reduction in College Kids, Real or Just Perception? Colleges around the country allow local animal rescues and trained therapy dogs to visit campus and interact with students at various time during the semester. One of the most popular is dogs visiting during the week of mid-terms and final exams, a particularly stressful time for college students. The popularity of these programs is evidenced by the number of students who flock to spend time with the dogs. I witnessed this first hand when I was a graduate student at the University of Arizona where such a program exists (http://www.wildcat.arizona.edu/article/2017/01/the-research-behind-therapy-dogs-is-limited-but-real). But as these programs grow, so do questions around their efficacy, both real and perceived. Researchers at the Virginia Commonwealth University conducted a study designed to “compare perceived and physiological stress levels before and after the therapy dog event and an attention-controlled condition.” They used a randomized, cross-over design (whereby study participants provide their own control in the study), and enrolled 78 students to receive a 15 minute interactive session with a group of therapy dogs followed by a 15 minute attention-controlled session where they completed a diagram denoting specific aspects of stress in their lives. Prior to randomization, participants provided a saliva sample and filled out two questionnaires – the Perceived Stress Scale (PSS) and stress visual analog scale (SVAS). Following randomization they received either the dog therapy intervention or attention controlled activity and again provided saliva and filled out the questionnaires. Following this they “crossed over” and received the activity that they did not receive during the first 15 minutes of the study and again provided a saliva sample and answered questionnaires. Students could not eat, drink, or use tobacco within one hour prior to participating in the study (this can interfere with analysis of saliva). Results showed a significant decrease in perceived stress within groups, and this had a large effect size in both groups. No changes in the PSS were detected, however. Saliva, which was analyzed for two stress hormones: salivary nerve growth factor (sNGF) and salivary alpha amylase (sAA) also revealed no statistically significant changes, and in fact no differences in sNGF were detectable and therefore were not analyzed. Given these results, researchers oncluded that dog visits can reduce perceived stress but not physiological stress reactions among college students in the week prior to exams. And while most of these programs are low cost, questions about their real and perceived effectiveness will persist, with critics weighing in on the lack of evidence to support them. 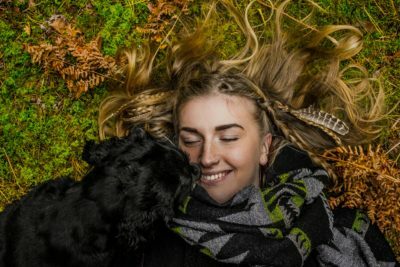 Therefore, this study, which shows that perceived stress among college students was reduced by visiting with dogs, is an important first step in bringing science to bear on this type of program. While physiological changes may not have been significant in this study, there might be several reasons for this. The first of course, is that dogs really don’t change people’s physiological responses to stress in such a short period of time. Another might be that changes did occur later in the day, hours following the visits with the dogs, but researchers didn’t measure any long term effects of these visits. Because the study took place the week before exams, it is possible that participants stress levels were not that high to begin with and visits from dogs did not effect changes in stress. Conducting this type of study during an exam week might yield better results, and this is something the researchers themselves noted. The aforementioned timing of the study. It is not clear why the researchers chose to conduct this the week before exams, given that dogs would likely have had an even stronger effect during the exam period. There was a high number of drop-outs in this study (N+=78, but only 57 completed). Researchers attributed this to the fact that students could not finish the study procedures and had to get to class. They noted in the article that they had anticipated a larger number of people enrolling in the study, but that the criteria of no food, drink, or tobacco in the hour prior to study activities significantly reduced the pool of eligible participants. That coupled with the high drop-out rate is an issue to be addressed in future studies utilizing similar designs. Although I understand the benefits of a one day design (simplicity, reduces chances of drop outs) I wonder if doing this over several days wouldn’t be better and/or having a control group who receives no dog interaction wouldn’t provide a better comparison (see my blog from January 14th on study design issues). Of the 57 participants who completed the study, 45 reported “dog ownership”. 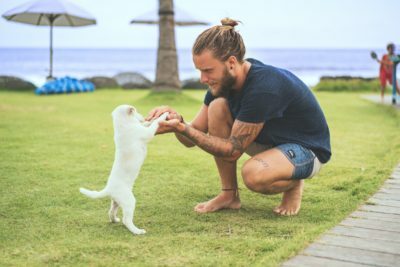 This suggests that this group of study participants may have been highly susceptible to the perceived effects of dog interaction and could have confounded the results. Future studies might do better to enroll equal numbers of dog owners and non-dog owners and examine the results in relation to these variables. How long do these perceptions of reduced stress last? This is a key question that I think remains to be answered and could have important implications for future work. Looking at the longer term effects of this…i.e. does it last through the exam taking period and have an effect on students’’ performance on exams…could be incredibly useful. How important is “perception” of reduced stress? Does this actually matter? Does it translate into any measurable outcomes that are important for health and/or stress reduction? Does it translate into better test taking skills and better test results? Knowing that stress can have strong negative impacts on our health, I think that the authors and perhaps the field in general, would do well to examine the effects of reductions in perceived stress on physiological measures of stress reduction and other health outcomes such as inflammation and immune responses. Great blog! Definitely got me thinking!